Crafts : Cool ideas that can be made with wooden pallets! 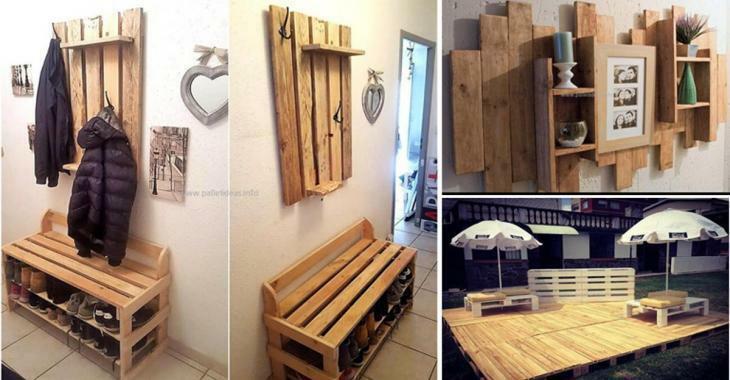 Cool ideas that can be made with wooden pallets! 12 new ideas that inspire you to decorate the interior or exterior of the house! Do you like seeing things made with pallet wood because it’s good to recycle and be green? People have been having more and more ideas to tinker with wood pallets. In this article, all new ideas! You will be able to find wooden pallets as used items on the net for less than $5 to $10 each. Do not forget that MB treated pallets are not recommended in the house. Use them instead to make outdoor furniture. In the house, we recommend the HT treated pallets. The treated pallets have a very visible inscription on the wood. Remember, it is strictly forbidden to take wooden pallets that are sometimes seen on the side of the street outside businesses. These wooden pallets are left there in order to be retrieved by a transport company for reuse. Taking them is considered theft. Recycle wooden pallets to make natural garden furniture! Recover wood from pallets to make it a garden furniture! This time stained a dark color! Recycle wood from pallets to make it into garden furniture! This time dyed a dark color! Recover wood from pallets to make some rustic-looking coolers! Magnificent! Quite a piece of furniture we have made here! All lit up in blue and from below, it changes a whole look! An excellent idea for making a twin bed! Here is a beautiful terrace completed at little cost! This coffee table steals the show in a beautiful salon! A great way to decorate an outdoor bar by the pool! A coat rack, bench, and storage in the hallway!